In the October 2018 Snapshot Survey, we asked contractors all about overcoming seasonality. Here's one survey question and its results from the summary report, which is now available in its entirety to EGIA members. Question: In a typical year, does your company layoff (or hire) seasonal employees? Once an all-too-common occurrence, seasonal layoffs have decreased to some degree in recent years as more and more companies have put an emphasis on seasonal initiatives and year-round planning to prevent the practice. 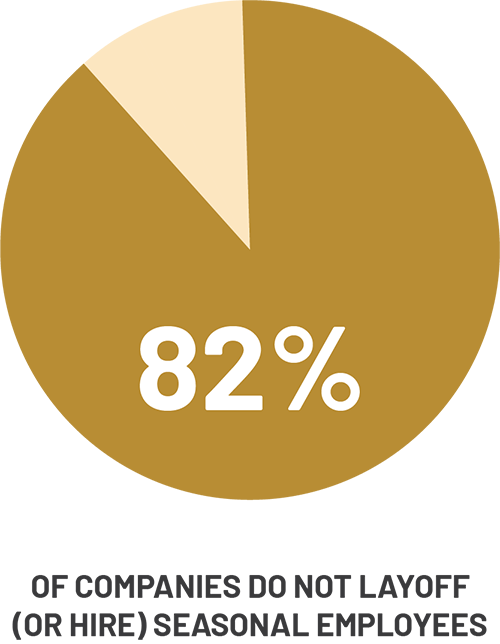 When asked if they hire or layoff seasonally, 82% of contractors we surveyed said they do not, against 18% that do. Most companies identify finding good people to hire as the primary issue they’re facing, so ensuring that, when the right person is hired, they don’t need to be let go during the offseason is of paramount importance. At the same time, someone who isn’t worth keeping throughout the year may not be an ideal hire just because it’s July, either. Some best practices to flatten the seasonal cycles and keep employees busy all the time include putting an emphasis on service agreements when employees find themselves in homes during busier times in the year, so techs can focus on maintenance during slow seasons, as well as seasonal marketing initiatives to drive business when it doesn’t happen organically. For a deep dive into local events and event marketing, and to access training materials, recommendations and education pieces, visit the Contracting Best Practices Library at the EGIA Member Dashboard.